The date sheet for Matric (9th and 10th) annual examination 2018 has been officially announced by BISE DG Khan board and for the facility of our visitors, here we have provided the complete date sheet which can be downloaded with just one click. The Board of Intermediate and Secondary Education, Dera Ghazi Khan is a government body which was formed in 1989 and since than it has been facilitating the educational needs of Dera Ghazi Khan, Rajanpur, Layyah and Muzaffargarh districts that come within its jurisdiction. Previously, these districts were being facilitated by BISE Multan board but due to vast area and large number of students, the need of a separate government body was felt which led to the establishment of BISE DG Khan board. 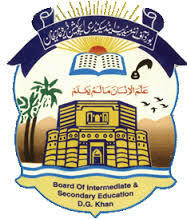 One of the key role of BISE DG Khan board is to organize and supervise the annual examinations of matric (9th and 10th class) and intermediate FA, FSc, ICS and I.Com. So far the board has successfully achieved its goal of organizing fair and transparent examination with efficiency and effectiveness which has helped it to build a reputation of being a reliable institute. A large number of candidates appear in the annual examination each year and like the numbers are expected to be high this year too. The registration of matric annual examination had started during December last year and now the papers are expected to begun from March but no announcement has been made officially yet. So it is strongly recommended to all of our visitors that they keep visiting this page on regular basis as the complete BISE DG Khan date sheet for Matric (9th and 10th) annual examination will be available here immediately after its release by the official authority. After the completion of examination, the board will also announce the result within the duration of next three months and it will also be available on our website. So keep visiting in order to stay updated with every news about BISE DG Khan matric annual examination 2018. For the Online preparation the Pakistan one of the Best Testing Website Gotest.pk has launched the online test preparation Service for the all type of exams we are advising you the you must try this testing service its respective test has been provided below you should attempt the Test and get instant Result it will be very helpful for you.